On August 12, 2017, the Wayne County Genealogical & Historical Society held a dedication ceremony in honor of James Maynard, Revolutionary War Soldier. The Master of Ceremonies was L. Herbert Dawson, Vice President of WCGHS, who did a wonderful job presenting the program. The ceremony began at the Dunlow Community Center, beginning at 1 p.m. The Tolsia High School Jr. ROTC posted the Colors and then led the audience in the Pledge Of Allegiance. This was followed by the singing of the National Anthem by the audience. An invocation followed led by Greg Michaels. The Rev. Ronald Maynard then proceeded with a presentation about the life of James Maynard, after which the Westmoreland Chapter DAR presented a program honoring James Maynard. A benediction was given by Robert Maynard, son of Rev. Ronald Maynard. It was Ronald Maynard and his son Robert who discovered the rock marking the grave of James Maynard, about a year ago. After the retiring of the Colors by the Tolsia High School Jr. ROTC, a lunch break was taken, where lunch was served to the audience by Sara Marcum, Secretary of the WCGHS. We also had present a number of groups which we were honored to have. These included The Westmoreland Chapter, DAR; Poage Chapter, Dar of Ashland, KY; Louisa Chapter, DAR of Louisa, KY; General Andrew Lewis Chapter, SAR of Huntington, WV; American Legion Post 93 of Ceredo-Kenova, which included the Honor Guard; Dunlow Volunteer Fire Department; Tolsia High School Jr. ROTC, Randall Reid-Smith, Commissioner of the West Virginia Department of Culture and History in Charleston, WV., Connie McCagg and her husband, Howard, who had cleaned off the grounds around the Marker and applied mulch, and to Bill and Addie Likens who manage the Community Center - what great hosts. All together, there were eighty plus persons in attendance. Ladies from the Poague Chapter DAR, Ashland, KY - Teresa Melvin, Debbie Mecca and Marilyn Oppenheimer. After lunch, a procession to the site of the Highway Marker took place. The Tolsia High School Jr. ROTC again presented the Colors, after which the Marker was unveiled by the officers of the WCGHS, John Jarrett Peters, L. Herbert Dawson, Sara Marcum and Howard Osburn. L. Herbert Dawson, Howard Osburn, John Jarrett Peters and Sara Marcum. Maynard Descendants at the marker. Then, the American Legion Post 93 Honor Guard, after a brief talk by the Post Chaplain, Bill Spencer, delivered the 21-gun salute, followed by the Pledge of Allegiance. Now, it was time for the trip to the Queen’s Ridge Cemetery, where James Maynard is buried. This convoy was led by the Dunlow Volunteer Fire Department. Many opted to make this ten mile trip, taking pictures and looking around for graves of additional relatives. 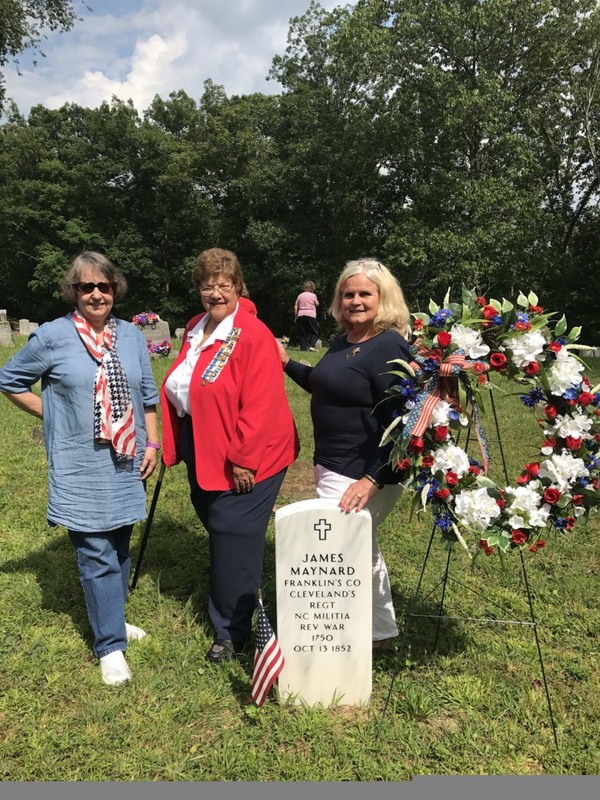 Ladies from the Westmoreland Chapter DAR at the gravesite. - Wylma Skean, Linda Parsons and Connie McCagg.